Golf TLC works directly with Green FORE Green, Omaha Steaks, Colorado Rockies, AMC Movie Theaters, Comedy Works and many others to bring you some of the best fundraising for your golf tournament. Golfers can sign up for the fundraising on the course, during registration or we can send an email blast for the golfers AND non golfers to make sure you get the most our of your fundraising! We have some great fundraising games below! Golf TLC's Best Seller is our SUPER TICKET! Entertain your golfers and fundraise with Golf TLC’s Super Ticket Package! We provide the games, staff, prizes and fun~ Plus split the net profit with your tournament! Your guests can purchase the “Super Ticket Package” for $50 and will be entered to play all 3 games one time! Your guests receive 2 custom made golf clubs JUST FOR PARTICIPATING! What do you need to do? Let us know where to send your check! Golf TLC has teamed up with Green FORE Green to bring you the best fundraising in the history of golf! Green FORE Green will set up on one of the Par 3 holes at your tournament. They play a Hole in One Challenge with your golfers. For a $20 entry fee per golfer (it is up to each individual golfer if they would like to play) they get a goody bag with golf, wine, movie ticket discounts, Omaha Steak discounts and much more! They also receive 2 free golf club certificates for a hybrid and a wedge! When the golfer hits the green they win a sleeve of golf balls! When the golfer hits a 20' circle around the pin, they win a 3 day resort stay certificate in their choice of 20 cities! A hole in one is a 7 DAY 2 BEDROOM CONDO RESORT stay! The BEST PART? There is no charge for tournaments registered with Golf TLC AND they donate 30 percent of the TOTAL SALES back to your tournament! PLUS donate to you a 7 night resort stay certificate to use as closest to the pin prize! Green FORE Green supports many charities such as TroopsDirect, Boys and Girls Club, Red Cross, Toys for Tots and many more! Let us entertain your guests at registration or following your tournament with our custom PLINKO BOARD! That's right...PLINKO! We supply the board, staff, prizes and FUN, PLUS pay YOU 30% of the TOTAL SALES! There is NO COST for us to come to your event. $10 Per person to play on our giant 4 foot Plinko Board. Prizes include resort stays, t-shirts, 2 for 1 Golf, beer koozies, Comedy Works tickets, and more! Would you like your OWN logoed Plinko Board to keep? Ask us! Looking to add some excitement, uniqueness and fun to your golf event, consider the Hot Shots Golf Air Cannon! ​An air powered device used to host a longest drive contest on a par 5 hole. Your players will have a blast as they launch a golf ball from tee to green. The air cannon will help raise additional monies for your cause while speeding up play on the course. We provide the staff, prizes and fun and PAY YOUR GROUP 30% of the TOTAL SALES!! The Longest Shot will win a 7 night resort stay in the winners choice of 20 cities! Golf TLC will set up on TWO of the Par 3 holes at your tournament. They play the TLC Challenge with your golfers. For a $35 entry fee per golfer (it is up to each individual golfer if they would like to play) they get a goody bag with golf, wine, MLB, Elitch Gardens and Omaha Steak gifts. They also receive 2 free golf club certificates for a hybrid and a wedge. When the golfer hits the green ON EITHER HOLE, they win a $200 VIP Resort Gift Card (good at over 800,000 resorts), When the golfer hits a 20' circle around EITHER pin, they win a $100 Pro Shop Gift Certificate! A hole in one is a 5 day 4 night, 4 STAR ALL INCLUSIVE hotel stay that includes hotel, food, drink and GOLF in Riviera Nayurit at the Marival Resorts! HOLE HECKLERS! ~​The "Hole Hecklers" are Making Funny Money for YOUR Golf Tournament! Who are these guys and why do I need to schedule them at our event?- “We’re just another hazard,” laughs Hole Hecklers founder Jon Chambers, a Colorado comic known as J Marc. ​Hole Hecklers have 3 packages to pick from, so you can be sure you have the best package for your audience! Hole Hecklers℠ provides a comedic kick with a new level of entertainment to your golf tournament. Make this the year’s most-talked-about event and provide new avenues to generate donations for your fundraiser or favorite charity. Hole Hecklers will provide you with two professional comedic commentators, brought to you by Hole Hecklers Sports Network, who are set up at a hole to heckle and roast golfers as they tee off. Not only will this sponsored hole be the best of your tourney, it also provides a funway to raise additional money for your fundraiser Whether participants chose the "$hut the Buck Up" option to pay for silence while they tee off, or they partake in the "Dough for Di$traction" alternative to pay for increased disruption directed at their partner, all proceeds go directly to your named charity or fundraiser. For continued entertainment after the tournament, the comics will assist with an amusing presentation of prizes (inclusive of handing out prizes to winners and gag gifts to "losers"), emceeing an auction, or just roasting the corporate management team! To finish out your successful event, the comics will provide a 45-60 minute stand-up comedy show that will have your participants laughing well after your event is over. Call us for Pricing and Schedule Requests! How it works: $20 per player to enter, each player gets 2 custom made golf clubs for entering and they SPIN THE WHEEL! Whatever number the wheel lands on is how many giant steps you get to add to your drive on a par 3 hole toward the pin! If the shot with the added feet hits the green they win a sleeve of golf balls! If they reach the circle within 10 feet from the pin with their drive + giant steps- they win a 2 night hotel stay in their choice of 50 resort cities! If they can reach the hole with their drive + giant steps they win A Hole in One! It is a 6 day, 7 night resort getaway in the golfers choice of over 30 cities! We supply the staff, prizes and fun AND we pay your tournament 30 percent of the TOTAL SALES! Our Partner's team of entertainers are all REMAX World Long Drive Finalists and world-class fundraisers. Each foursome will be greeted by the entertainer on a selected Par 5. The long drive entertainer will make a brief presentation to every team about the charity and/or foundation and will hit 1-2 drives per team. He will set goals for total donations raised for the day and provide entertainment with 400 yard drives. The entertainer will hit for every team that is playing in the golf outing. All teams and/or participants are under no obligation to make a donation. Any team making a donation to the charity on the entertainers tee box will have the opportunity to win a 3 day trip for two (2) to Pebble Beach should the player hole out from entertainer's long drive from the fairway. (HOLE IN 2). There is no risk or out-of-pocket costs to the charity. We supply the staff, prizes and the net proceeds raised on our hole for the day are split 50/50 to your charity. For only $4.00 a player Golf TLC will send you everything you need to host your own fundraising game on a par 3 hole! Have a volunteer play the game with the golfers. You charge $20 an entry and make $16.00 per player to add to your charity! OR you can just let everyone play for additional fun at your tournament! The Par-Tee in a Box includes a goody package for each player with 2 free golf club certificates (a hybrid and a wedge), Discounts at Movie theaters nationwide, Omaha Steak discount, $5 to Lyft, access to discounted MLB tickets, discounted concert tickets and much more! 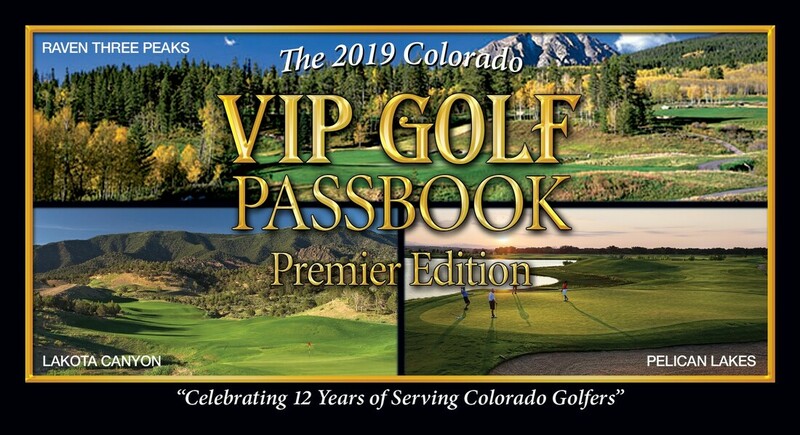 Colorado's VIP Golf Passbook Fundraiser! Events TLC takes care of all the shipping and processing! Your group receives $15 for every book sold! A. No risk, out of pocket cost, or financial obligation is required. 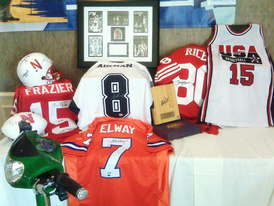 hand signed, authenticated memorabilia from sports legends and celebrities. C. Each no risk auction program is fully customized to maximize positive results for your charity. D. For each item that is sold, you pay a low wholesale cost and 100% of additional funds raised are donated to your charity. E. There is no cost for unsold items. Click Here for MORE FUNdraisers!